Goat anti Bovine, Human, Mouse TXNDC5 / TLP46. Peptide with sequence from the internal region of the protein sequence according to NP_110437.2; NP_001139021.1. Peptide ELISA: 1/16000 (Detection Limit). 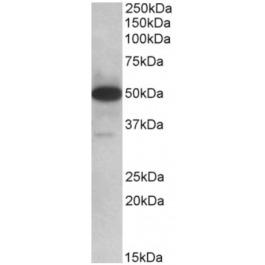 Western blot: 0.1-0.3 µg/ml. Approx 50kDa plus faint 35kDa bands observed in Human Lymph Nodes lysates and 48kDa in Mouse Lymph Node and in Mouse Intestine lysates (calculated MW of 47.6kDa according to Human NP_110437.2, 46.4kDa to Mouse NP_663342.3) and of 36.2kDa according to Human NP_001139021.1. 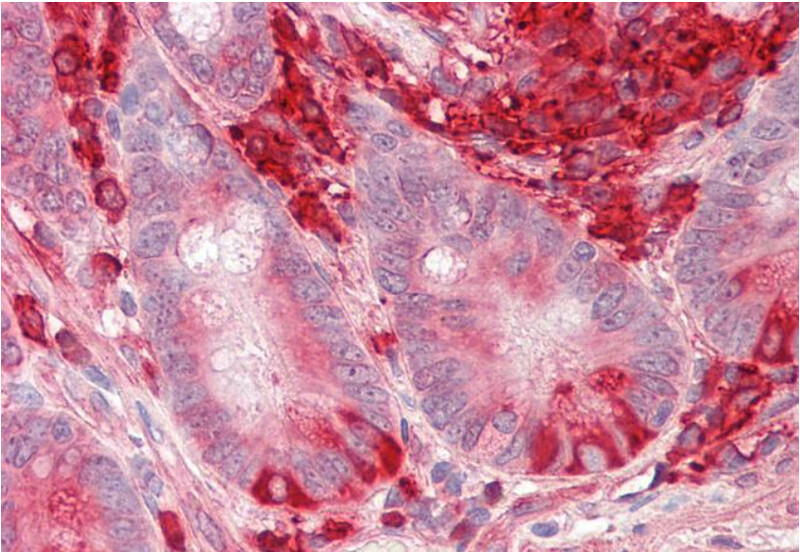 Immunohistochemistry on Paraffin Sections: 3.75 µg/ml (Human Small Intestine). This antibody is expected to recognize both reported isoforms (NP_110437.2; NP_001139021.1).